A family from Albany Creek, on Brisbane's north side, recently woke to find both of their guinea pigs missing and a new resident in their guinea pig hutch. Whilst the hutch was in excellent condition it turns out that the Coastal Carpet Python had made it's way under the edge of the hutch which was on slightly uneven ground. The kids were stoked to have an encounter with a carpet snake however were a little sad that their guinea pigs had been consumed. Sadly this is a common occurrence across Brisbane. 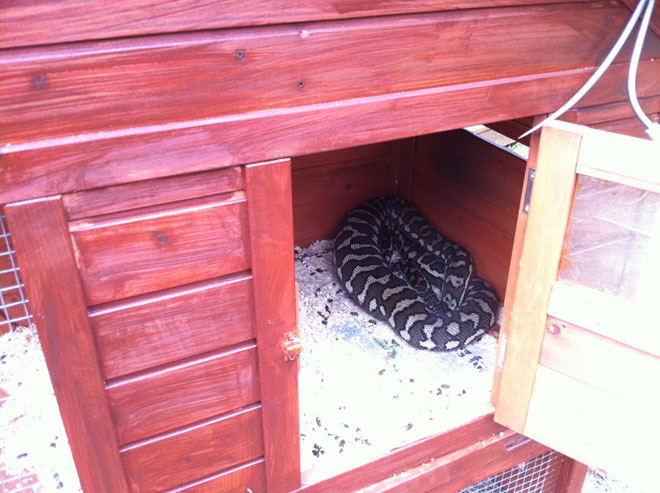 Even inner city suburbs of Brisbane such as Ashgrove and Everton Park lose small pets to snakes. A couple of steps to help reduce the chance of an encounter include keeping pet food in sealed containers and snake proof your enclosures. 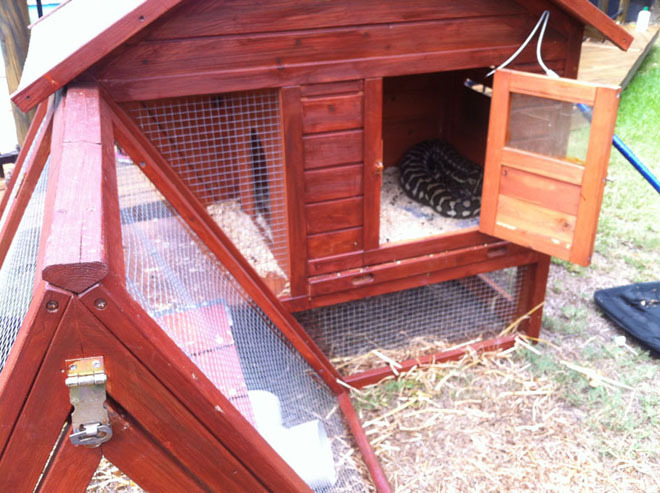 How do I 'snake proof' my guinea pig hutch? It can be difficult to explain the loss of a pet to a child. When explaining the situation it is important to point out the snake did not set out to eat the childs pet. It's not evil or nasty it just needed something to eat. It's important for them to know there was no malice, it's just an animal looking for a meal. This helps the child to understand that there is no such thing as a nasty animal and that all animals need to eat. Oh and one last word of advice... Look in before you reach in! !